Why the Media Silence on Lindsey Graham’s Vow to Use the Military to Force Vote in Congress? The protracted 2016 presidential campaign cycle has already begun, and with it the close attention of the media to the statements made by prospective candidates in hopes of discovering even the slightest “gaffe” that can be turned into a political news item. All the more odd then that the remarks made at a New Hampshire town hall meeting by one Republican presidential hopeful, Senator Lindsey Graham of South Carolina, have been virtually blacked out by all of the major print and broadcast outlets. Asked by a member of the audience what he would do about automatic cuts to the Pentagon budget that would go into effect because of sequestration, Graham responded that the problem had left him sick to his stomach. The statement is extraordinary. A candidate for the presidency of the United States vows that, once elected, he would use the military to impose his—and its—will upon a recalcitrant Congress. Presumably, troops would hold members of the House and Senate at gunpoint until they produced the results demanded. What Graham described is in essence a military coup, much like those organized by the Pentagon and the CIA in countries like Iran, Guatemala, Brazil, Indonesia, Chile and Argentina, claiming hundreds of thousands of lives in the process. Graham’s aides subsequently tried to portray Graham’s statement as a an attempt at humor, insisting that it was not to be taken “literally,” even though the candidate himself stressed that unleashing the military on Congress was “literally” something he would do. The New York Times, the supposed “paper of record,” maintained a complete silence on Graham’s remarks. It did post a puff piece reporting that Graham is one of a number of senators who “rarely or never use email,” while noting reassuringly that “Lawmakers can certainly be effective without using email since they employ staff who send messages on their behalf.” Hot news indeed. 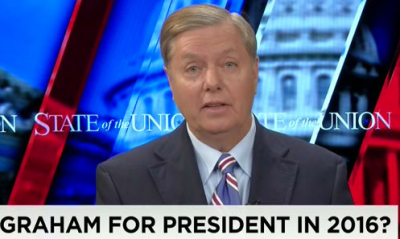 Graham’s remark was no mere “gaffe,” much less meaningless. It expresses real relations within the US government, which after nearly 14 years of continuous war has seen an immense growth in the power and influence of the military and intelligence apparatus. This protracted eruption of militarism has gone hand-in-hand with the monopolization of wealth and political power in the hands of a financial oligarchy and the unprecedented deepening of social inequality. These processes, rooted in the crisis of American capitalism, have steadily eroded and hollowed out what remains of constitutional government and democratic rights in the US. These relations have found concrete expression in the ongoing discussions over sequestration and the military budget, with a parade of generals, admirals and civilian Pentagon officials coming before Congress to predict catastrophe and global defeat if any part of the gargantuan spending on arms and military operations is cut. The all but stated premise behind this testimony is that the generals and admirals are the only ones qualified to set military policy, and the Congress, ostensibly consisting of the elected representatives of the people, should get out of their way. This is a viewpoint that elements like Graham echo and endorse. Under conditions of deepening crisis and rising social conflict, it is not such a leap from this position to the military taking a more direct hand in dictating government policy, along the lines suggested by Graham to the town meeting in New Hampshire. If the corporate media has no interest in probing the real relations underlying Graham’s remarks, it is because it is fully complicit in the conspiracies to wage war abroad and eviscerate democratic rights at home. It is fulfilling its function as an instrument of the corporate and financial elite: not to expose or clarify, but to cover up the real dangers confronting the working class.